So hello HMRC, pull up a chair and have a cuppa. Which makes me wonder quite a few things, firstly just what are they looking for as part of their reviews? Secondly how did they identify the letter? This could just be that so few people applied that it was obvious or it could be that in the HMRC details there was a non-obvious identifier. I accept I could have done a better job with blocking out my details, but all the HMRC details looked fairly generic. To get from the greyed out details to something in their records would take a bit of effort, and the rest of the letter looks fairly generic so I wouldn’t have though that traceable. Unless they had very few applicants which is more than possible given how badly they advertised the scheme. I’d love to hear other peoples thought on this one, as it may be relevant for anyone else wanting to share HMRC correspondence. Also is it just me or does their tone seem a bit peeved about the HMRC details not being greyed out? I would have thought HMRC contact details would be public knowledge. 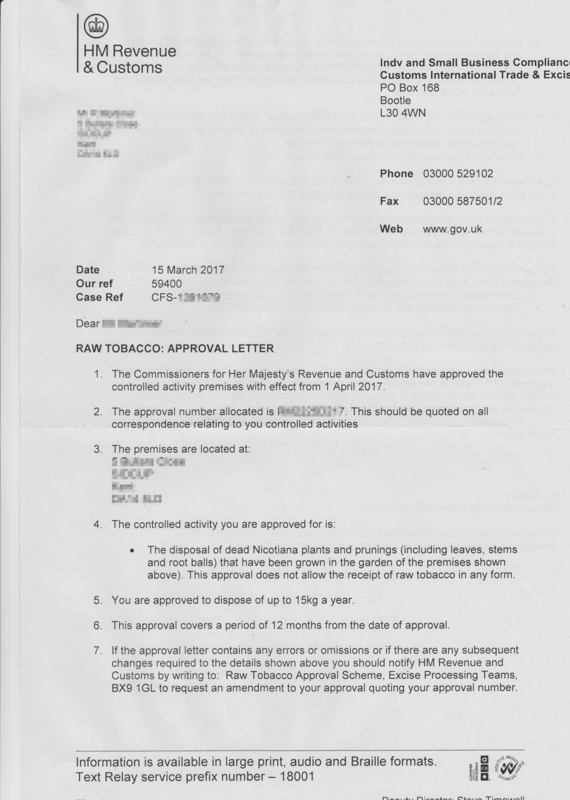 “Please provide an explanation for the above entries on the Anonymong website, in particular how a copy of the Raw Tobacco approval letter issues by the HMRC to yourself appeared on this website. I’ve checked all my previous correspondence and no where does it say that I have to keep the information in the letter confidential, and the relevant approval and such numbers were obscured anyway so that shouldn’t be an issue in any case. When I asked them why they needed the information the very nice lady who wrote to me claimed it was to make sure my data hadn’t been stolen or anything, which I don’t really find very convincing especially given the tone of the letter. So if not that, which I’m really not convinced by, anyone want to suggest why the HMRC would be concerned that a fairly generic letter with identifying details obscured was published? The letter then went on to say that if I didn’t reply then my Raw Tobacco approval would not be renewed and “may affect any future RTAS application”. They then very thoughtfully included a fact sheet about excise compliance checks. I would have thought it would have made more sense to provide that when I first registered if it was just to be helpful, otherwise one might thing it was a hint of a threat. If they were that concerned about my data having been stolen or comprised I would have hoped they might have got in touch sooner rather than waiting for the next time they had to write to me, though perhaps the problem was just in a report attached to my file and no one was looking at it. Though that does rather make the value of their internet surveillance rather questionable, as any harm that could have happened from the registration would have happened by now. I don’t for a moment think they only happened to discover it just before writing to me, if I had a few spare hours looking back through server logs might be illuminating. All very interesting, HMRC are it seems watching and paying attention – though for just what purposes and how they’re matching what’s on the internet to their systems is a very interesting question. Maybe they just had so few registrations they assume that everyone that registered for non-business purposes was a wrong-un. Anyone else had the HMRC in touch about a blog post? Tagged activism, Civil Liberties, freedom, HMRC, smoking, taxes, Tobacco. Bookmark the permalink. 1. Letters sent on 15th March 2017 narrows the field. 3. Case Ref CFS- may narrow it. 6. *Maybe, just maybe* the premises address is a single-digit house number, in a Close with a short 5/6-character name, in Sidcup, Kent with a DA postcode? Squint (read cross-eyed) at the pixellations! All points well made. I should have pixelated more and harder, the “their reference” was an obvious one I completely overlooked. Still interesting that they cross reference what they find on the internet with their records and I still wonder just what they’re looking out for. It’s possible somebody could phone up and pretend to be you and make trouble using an HMRC letter reference number but as they usually ask for your NI number and other bits and pieces then I don’t know how feasibly that is. Or it could be a system put in place in case someone else published letters containing your tax situation..but again, surely that would warrant a more immediate response..
You have to hunt hard for some of them, but HMRC contact details are available on the web (although their site layout is so jumbled in places, I guess they could claim a “security through obscurity” tactic). It looks like someone got an alert from a system and responded by sending out the generic “iffy web activity” response because (as you say), it really doesn’t make an awful lot of sense as to why they tacked this onto the end of your approval renewal notice otherwise. I suspect the lady you spoke probably didn’t know either – maybe they are checking to make sure you aren’t trying to sell cheap homemade ciggies via your blog? Who can tell? That’s what interesting, the most recent letter is definitely custom, but the what’s going part was appended to the usual you need to renew your approval boiler plate. So I wonder if it was a case of “when this one renews check what’s going on”.